These Stanley FatMax® heavy-duty box levels are machine milled on two sides to ensure accuracy, and have improved vial views for ease of use. The large centre vial is bridged to allow a continuous line to be marked on the work piece. 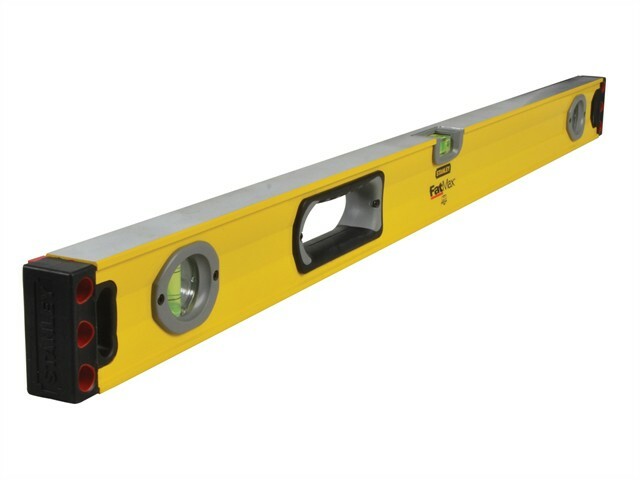 The dual bi-material grips are ideal for carrying and vertical levelling, and the levels have shock absorbing end caps for longer life. FaxMax levels have an accuracy of ±0.5mm/m on one face and ± 0.7mm/m on the other, which is covered under a 5 year accuracy guarantee. The levels in this range are 6mm taller than most competitors, 6-9mm wider than other levels and are heaviest in their class, providing ultimate strength and durability.